Marcell Ozuna hit his second grand slam of the season in the Cardinals' win over the Cubs on Saturday. ST. LOUIS — A change in lineup spots has done Marcell Ozuna good. 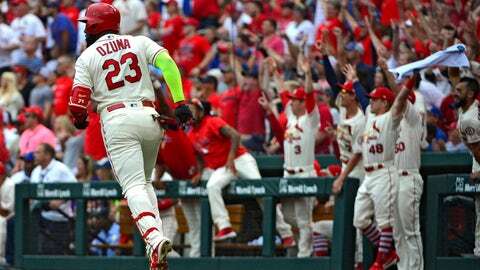 Ozuna hit a grand slam during a six-run first inning, Miles Mikolas pitched six strong innings and the St. Louis Cardinals beat the Chicago Cubs 6-2 Saturday in front of a season-high crowd of 47,514 at Busch Stadium. The Cardinals improved to 9-6 this season against the NL Central-leading Cubs. Chicago has lost four of six overall. Ozuna hit his second grand slam this season and the fifth of his career. Ozuna had three hits and is 5 for 8 since dropping from cleanup to the fifth spot in the Cardinals lineup. Jose Martinez drew a bases-loaded walk from Jose Quintana (9-7) and Ozuna followed with his 11th home run. Yairo Munoz added an RBI double. The last time the Cardinals scored six runs in the opening inning was eight years to the day, on July 28, 2010, against the Mets. Quintana needed 33 pitches to record his first out and 51 pitches to get through the first. The six runs were the most Quintana has allowed in the first inning this season — he had given up just four earned runs in the first inning through 19 starts. Mikolas (11-3) allowed six hits, including a two-run homer by Javier Baez, who connected for the second time in the series. Three St. Louis relievers each pitched a scoreless inning. Jesse Chavez pitched three innings as Cubs relievers shut out the Cardinals for the final six innings. Ozuna says he ate some of Carpenter’s salsa in Cincinnati, and though it “did a little bit of good on defense” in that series, it clearly paid off offensively today as he hit his second grand slam of the season. Cardinals right-hander Dakota Hudson made his first major league appearance in the seventh. Hudson, a first-round pick in 2016 out of Mississippi State, struck out Kyle Schwarber and Ian Happ while retiring all three batters he faced. Missouri Gov. Mike Parson threw out the first pitch, a strike, to Shildt. Cubs: SS Addison Russell (bruised knuckle left middle finger) missed his second straight game, but is expected to play Sunday. … RHP Cory Mazzoni was recalled from Triple-A Iowa and RHP Alec Mills was optioned. Cardinals: RHP Michael Wacha (left oblique strain) started a light throwing program. The Cubs will start RHP Kyle Hendricks (6-8, 3.99 ERA) in the series finale against the Cardinals and RHP John Gant (3-3, 3.17 ERA) on Sunday night. Hendricks in 3-2 with a 3.58 ERA in 12 career starts against St. Louis. Gant threw five shutout innings against the Cubs on July 21 and is making his third career start.